The Nines is one of the most sophisticated hotels in Portland, Oregon. 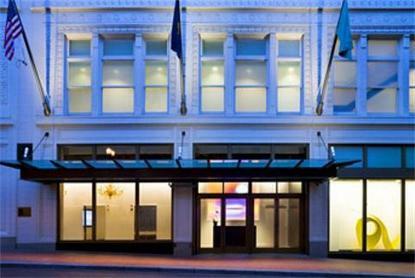 Set on the upper floors of the historic Meier & Frank Building, it offers luxurious accommodations to go with its excellent downtown location next to Pioneer Square. When guests aren’t relaxing in their stylish rooms and suites, they can shop downstairs at Macy’s, dine in the nearby Pearl District, or hop on the MAX light rail to explore other parts of the city. The Nines is as convenient as it is comfortable, and therein lies the secret to its success. The Nines offers a total of 331 rooms and suites. Inside these cozy quarters, style and amenities abound. Individual climate control, plush bedding, refreshment centers, 42-inch HDTVs, DVD players, and iPod docking stations are just some of the standard perks. Outside of the rooms and suites, guests of The Nines Portland will find an array of satisfying facilities, including a concierge desk, a 24-hour business center, a 24-hour fitness center, meeting rooms with original art pieces, two restaurants, and a cocktail lounge. There are different room categories to select from at The Nines. At the top of the list is the Meier & Frank Suite. This airy, 1,536-square-foot haven comes complete with a living room, an adjacent dining room, a jetted tub in the main bathroom, and an additional half bathroom. Ideal for relaxing or entertaining, the Meier & Frank Suite also boasts wonderful city views that set the perfect backdrop for Portland escapes.